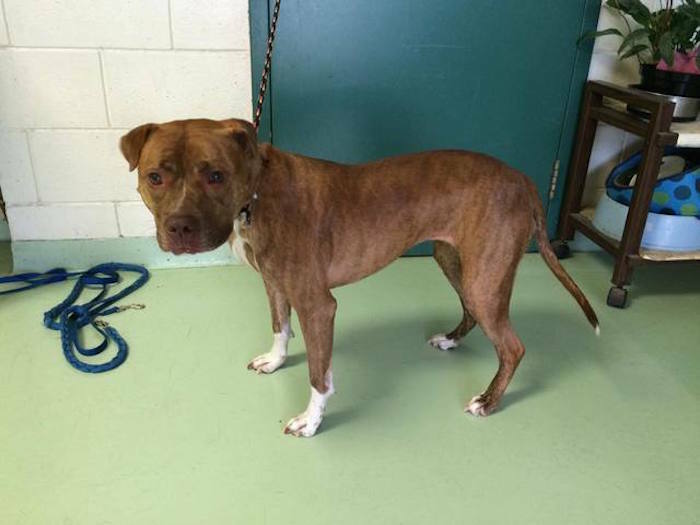 Mira, the pit bull, is just another dog that was abandoned by her owner. She was simply dropped off at the nearby shelter, without remorse. As the dog was trying to figure out what was going on and where her dad was going without her, he didn’t even turn his head to look at her or hug her one last time. Many of these dogs can’t cope with the fact their owners are gone, and can’t adapt to the life in the noisy shelters, so they easily get depressed and lead an unhappy and miserable lives. However, this particular story shared by Chicago’s Trio Animal Foundation, speaks about all the losses, as well as the new beginnings the shelter dogs go through. Those who are lucky, get a second chance for a better life and end up in a loving forever home. Luckily, that is what happened to Mira. “This girl’s heart broke the moment her dad walked out the door. Yesterday, while at an open access shelter, a man walked in with his dog named Mira. He said that he was moving and no longer had time for her. Mira was wagging her tail and was so proud and happy to be walking with her dad. It was not until they were removing her collar and replacing it with a slip lead that she started to realize that something was up. It was then that her dad turned around and walked out the door. As Mira watched her dad walk away, she started to whimper. Once he made it outside, she began to cry for him. Mira did everything that she could to get out the door to be reunited with her dad and her stress level quickly went through the roof… she just cried and cried. At this point, I knew that she would have a complete meltdown if she were put in the general population with the other homeless dogs. I asked if she could stay out by the front desk with me so that she could be calmed down. Needless to say, I didn’t have the heart to bring her to the back room and so she ended up in my car. Mira will be adopted out through TAF’s rescue division, Project Rescue Chicago. This beautiful girl is 3 years old, potty trained, dog friendly and good with kids (she has never been tested with cats). Just this past week, Mira sat frantically crying at the front door of an open access shelter as her former dad walked out and left her behind… for the days to come, she cried and found it hard to eat. Mira’s heart was shattered into a million pieces. We at TAF knew that it would take a caring and gentle man to mend Mira’s emotional wounds and make her happy, again. Well, as fate would have it, that man was about to walk into Mira’s life and help to ease her pain and show her that she was loved. 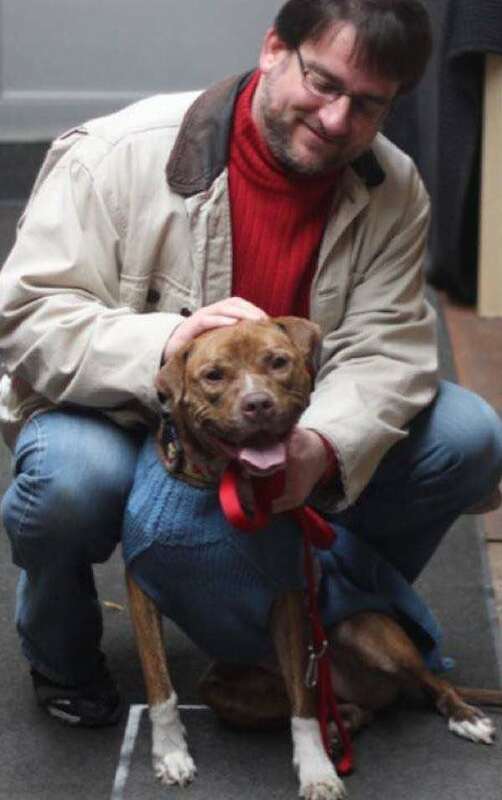 A while back, Mira’s new dad lost his senior pittie girl to cancer and the thought of bringing a new pup into his life was just too painful… after caring for his baby girl until the end, his heart was broken. It was not until he saw Mira’s story and the look of despair in her eyes that he knew they were meant to be together. That very same day he filled out an adoption application and the rest is history. 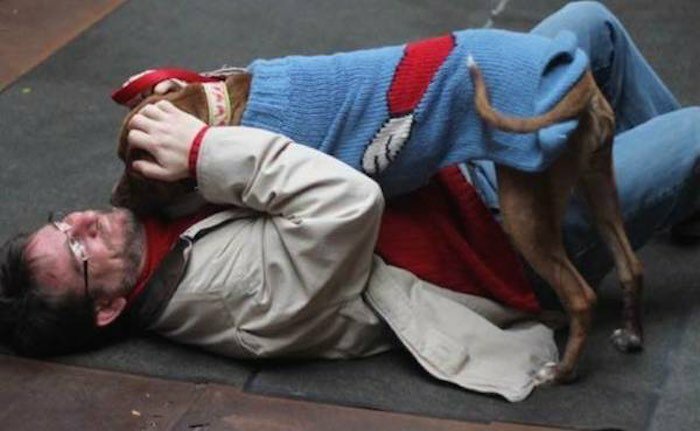 The man who adopted loving Mira has lost his dog and now the two can be happy again because they have each other. This all tells us what a difference we can make in an animal’s life if we decide to adopt them from the shelters. We hope they have an amazing life ahead. Photo: Trio Animal FoundationShare this story! !